British Dealer News is the industry’s only monthly trade magazine dedicated to motorcycles, scooters, ATVs and associated aftermarkets. It’s written for professionals, by professionals – a knowledgeable team of journalists committed to providing objective reports on all the latest industry news and events. The magazine’s unrivalled coverage of industry current affairs is supported by in-depth profiles, market analysis, sales statistics and new product developments. British Dealer News is distributed free on request to the trade and, uniquely, has a ABC-audited circulation. It is mailed to named dealer principals, retail department managers, wholesalers and importers, UK manufacturers and engineering companies as well as finance, insurance, IT and training providers. Informative, balanced and diverse. British Dealer News, its associated website and weekly news and products emailer provide vital trade information and news. Taken together, they keep readers informed on a daily, weekly and monthly basis. Independent research shows 93 per cent of readers rate British Dealer News as good to excellent for content, accuracy and editorial quality. 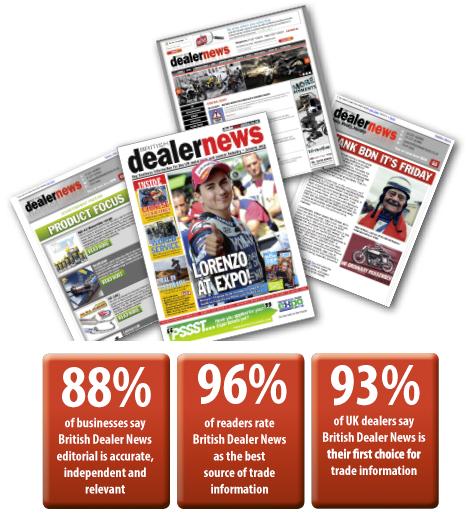 Over 90 per cent of readers said British Dealer News helped them make buying decisions. As an industry communications tool, British Dealer News stands alone. For communication and value, nothing comes near it.